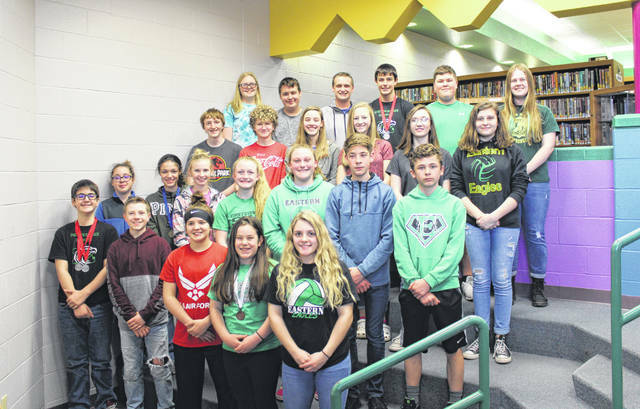 Eastern Science Olympiad participants (Row 1, from left) Seth Collins, Peyton Buckley, Hope Reed, Hayley Sanders, Juli Durst; (Row 2, from left) Aszandra Schultz, Savannah Barnes, Abby Guthrie, Kyra Zuspan, Ella Carleton, Brayden O’Brien, Trey Hill; (Row 3, from left) Koen Sellers, Grant Martin, Lilly Suttle, Sydney Reynolds, Kendyl Householder, Breanna Nelson; (Row 4, from left) Olivia Harris, Lane Barber, Jacob Spencer, Trenton Morrissey, Ethan Short and Emma Epling. Eastern Science Olympiad students are pictured following the trophy presentation at the recent competition. 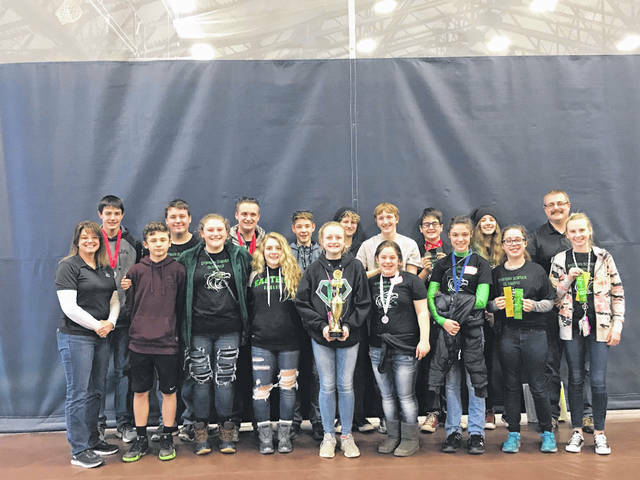 REEDSVILLE — For the second consecutive year Eastern will be sending a Science Olympiad team to the state competition. Eastern Middle School Team One took second place in the regional competition held in Marietta. Last year was the first time the program, which began six years ago, had sent a full team to the competition. Eastern’s second team was not eligible in the team standings as there was not enough team members/events competed in for a complete team. Teams competed in the areas of life, personal and social science (anatomy and physiology, disease detectives, heredity, herpetology, and water quality), Earth and space science (dynamic planet, fossils, meteorology, road scholar, and solar system), physical science and chemistry (circuit lab, crime busters, density lab, potions and poisons, and thermodynamics), technology and engineering (battery buggy, boomilever, elastic launched gliders and roller coasters), and inquiry and nature of science (experimental design, game on, mystery architecture, and write it do it). Placing first in their respective events were as follows: Lilly Suttle and Savannah Barnes in Roller Coaster; Juli Durst and Brayden O’Brien in Water Quality; Lilly Suttle and Grant Martin in Road Scholar; and Emma Epling and Olivia Harris in Anatomy and Physiology. Taking second in their respective events were the following: Ella Carleton and Juli Durst in Disease Detective; Lilly Suttle and Seth Collins in Herpetology; Ella Carleton and Jacob Spencer in Meteorology; and Grant Martin and Seth Collins in Mystery Architecture. Team 1 members were Trent Morrissey, Lane Barber, Ella Carleton, Juli Durst, Savannah Barnes, Brayden O’Brien, Seth Collins, Sydney Reynolds, Trey Hill, Grant Martin, Jacob Spencer, Hayley Sanders, Koen Sellers, Lilly Suttle and Kyra Zuspan. Team 2 members were Olivia Harris, Emma Epling, Abby Guthrie, Aszandra Schultz, Breanna Nelson, Kendyl Householder, Peyton Buckley, Hope Reed and Ethan Short. The teams are led by teacher Krista Johnson. The stat competition is to take place on April 27 in Columbus.